As father time catches up to every athlete at some stage, each era passes the torch onto another. In the retro world, once an NFL gridiron great retires, it takes a few years for that torch to be lit for vintage collectors. We’ve got a few suggestions for recently retired players worth investing in, as you might even get to watch their stock rise once again and your pocketbook fatten in the process. Brett Favre. What can you say? Whether you were entranced by his play on the field, or annoyed by his retirement antics, you can’t argue with his career numbers. While his tour with the New York Jets seemed like the end at the time, he resurrected his career again with the Vikings and went on to break too many records to name. You have to take the good with the bad when it comes to Favre. But while he may have thrown the most interceptions in history, he threw for 10,000 MORE yards than second place on the list, a guy you may have heard of named Dan Marino (71,838 to Marino’s 61,361). In the world of cardboard, Favre entered the league just as the printing presses of card companies went crazy. Whereas nowadays some rookies have well over 250+ rookie cards on the market, Favre at least only has around 20+ cards that can be considered first year issues. One of the most well known RC’s of any sport over the last 20 years, his 1991 Stadium Club has been a staple in the industry. This is evident by the fact that over 9,000 have been submitted to PSA, with over 1,000 of them grading at a GM MT 10, and the cards ability to always pop up no matter where you go. Remember Action Packed? Well, some of you will. This is a great card with a unique texture, and is worth considering, only run about $20-$40. Autograph Rookie cards were just becoming ‘hip’ at the time, and this is a tough find in pristine condition. Relatively cheap between $60 and $200 depending on condition or grade. Only around 7 of these have been graded at the GM MT 10 range by PSA, and you can expect to pay a high premium. Click here to take a look at Favre rookie cards on eBay. Another recent retiree on the 'invest now' list, is Ladanian Tomlinson. Like many heroes, LT (the 2nd coming) did not choose the Barry Sanders route to retire at the very top of his game. While Sanders rushed for 2,000 yards in 1997, and then followed up with a 1,400 yard season in 1998 and abruptly retired, LT went to the New York Jets for his final 2 seasons, rushing for 914 yards in 2010, followed by 280 in his final season. Why is this important? Isn’t this the same guy who rushed for 13,684 yards, good for 5th on the alltime list? Yes, and he also scored 162 career touchdowns, 3rd all-time. But some of the legend and lore that was so obvious during his prime with the San Diego Chargers lost its luster over his last few seasons. As Tomlinson heads toward a surefire first ballot hall of fame induction, his value will once again be more appreciated for the totality of his accomplishments and the time to buy is now. Autographed and refractor versions available as well. The centering of these cards is worth close attention. Here's what's up for bid now. The Kurt Warner story is well documented, from stocking grocery shelves to Super Bowl champion. Starting only one season at Northern Iowa, Warner went undrafted and failed to catch on during a tryout with the Green Bay Packers in 1994. He would work at a grocery store and do a little coaching before going to the Iowa Barnstormers of the Arena League in 1995, and onto NFL Europe in 1998. In 1999, Warner was slated to be the backup for the St Louis Rams, but took over for an injured Trent Green and ended up winning MVP of both the regular season and the Super Bowl along the way to the title. Similar to Favre above, he had a single rough year in New York (Warner for the Giants) but he also rebounded with his next team, also like Favre. In 2008, he led the Cardinals to a Super Bowl appearance, and despite losing to the Steelers for a 1-2 career record in the big game, Warner holds the three highest single-game passing yardage totals in the history of the Super Bowl. Though he has just over a dozen official RCs - as card companies scrambled to get him into late-season sets in 1999 during his rise to stardom - he does have an autographed card, Playoff Contenders that is probably considered the best investment for his RC. 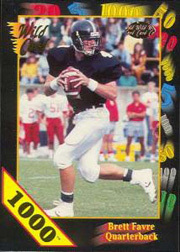 There are also a few 1995 Iowa Barnstormer cards out there, from his days in the Arena league, and some collectors might prefer this due the uniqueness of the card. It seems that offensive players always get the glory, and the trading card world is no different. But we’d be amiss if we didn't include one name to the list of potential risers from the defensive side of the ball. While Derrick Brooks or Junior Seau are probably higher ranked on the echelon of defensive players in history, we give the nod to Michael Strahan. While many players remain in the bright lights of the TV world, not too many have made the transition outside of the sports world. In September of 2012, Strahan permanently joined the highly rated television morning talk showLive! with Kelly and Michael alongsideKelly Ripa. This may help the value of his cards over time. Strahan holds the single-season NFL sack record with 22.5, but not without controversy. Brett Favre famously slid down on the play, and was widely criticized for ‘giving’ Strahan the record, albeit deserved. Strahan has always seemed to be able to remain in the spotlight some way or another, and that can only mean good things for card investors. Strahan's best card and probably the only one worth buying for the long term is the 1993 Fleer Ultra RC. A PSA 10 GEM MINT was sold recently for $75, up from $40 in 2012. Check out Strahan's reasonably priced rookies here.